Fall has always been my favorite time of year and now there’s a reason to love it even more: the Orcas Island Film Festival. This year’s cinematic lineup at the October 6th-9th event was top-notch, featuring films from all over the globe including many Oscar-contenders that hadn’t yet been released in theaters. I only saw a handful of the 30 films, and though I enjoyed them immensely, what really elevated the experience for me was the energetic buzz among attendees before and after the showings – a feeling of being part of a community that values art and creativity. It Takes An Island will be shown at the 2018 Seattle International Film Festival (SIFF) – the largest and most highly attended film festival in the U.S.! Orcas is full of feel-good stories like the Litch brothers featured in the film. Our own Sea View Theater is a prime example. A few years ago, the Sea View was in danger of closing its doors after the movie industry converted to digital. The theater’s owner didn’t have the funds required to upgrade the old projector, so in classic Orcas fashion, a fundraising campaign was launched to save the theater. Today the Sea View provides not only first-run films, but also a stage for live entertainment and local talent. Complementing the world-class offerings at Orcas Center, the Sea View Theater brings the community together to celebrate art and culture, island-style. See you at the 2018 Film Fest! 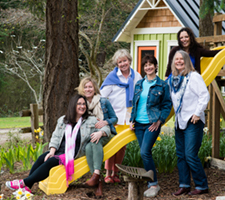 Sandi Friel, Realtor®, movie-buff and lover of the simple life on Orcas Island. Contact me to find your way home.